The National Eagle Scout Association (NESA) is a fellowship of men who have achieved the Eagle Scout rank. Only 5 percent of Scouts ever reach this goal. Only those who have been granted the Eagle Scout Award by, and who are members in good standing with, the Boy Scouts of America may hold membership in the National Eagle Scout Association. 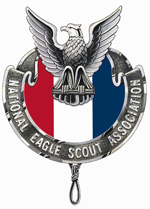 Applications for NESA membership are cross-checked against the national Eagle Scout register maintained by the Eagle Scout Service. Our mission is to serve Eagle Scouts and, through them, the entire Scouting movement. Our mission is to support NESA’s mission, the council’s mission and vision and to provide networking opportunities and social events for Eagle Scouts. An opportunity to network with fellow Eagle Scouts and reconnect with Scouting. NESA Members making a presentation to a new Eagle Scout at his Court of Honor. The window for 2015 Eagle Scout scholarships - offering cash for college to those who have earned Scouting's highest honor — is now open. The deadline to apply is earlier this year; applications must be received by Oct. 31, 2015. For more information, please visit www.nesa.org/2015_scholarships.